Welcome to the new year of Pass the Cook Book Club! Every month, three recipes from a cookbook is chosen, and bloggers re-create and feature one of the chosen recipes. This month, Christiane from The Mom Chef: Taking on Magazines One Recipe at a Time chose The Silver Palate Good Times Cook Book. She chose three delightful recipes: seafood lasagna, vegetable pot pie, and white chocolate mousse with Frangelico. I chose to make the mousse recipe, but was completely torn about which liqueur to use. I love hazelnut, so I was intrigued by the Frangelico but I also wanted to try the recipe with Chambord, which is a raspberry liqueur. When I finally went to gather my ingredients at the grocery store, they actually didn't have any Frangelico or hazelnut liqueur, but they had a bottle of Chambord so that helped me definitely with my decision! This recipe is incredibly easy to make and doesn't need a lot of ingredients. This recipe does, however, take two things: time and dishes. The actual mousse itself doesn't take a lot of time to make, but it does take time to set. So if you're planning on serving this dish, make sure to make it the day before or several hours (i.e. the morning of) that you plan to serve this dish! The other thing I didn't expect was the amount of dishes that this dessert took to make! I believe I used two saucepans, and five mixing bowls... not to mention all the utensils! This dessert is definitely worth making. The texture is light and smooth, and the Chambord and white chocolate are not overpowering and complement each well. Although this dessert is very decadent, it goes down easy so you must use portion control (or not)! This recipe makes a TON, so you might want to consider halving the recipe if you're serving 4-6 people. I also think that this mousse will make a great mousse pie or other filling, but it might need a little more stabilizer... I might be experimenting with this more in the future. The mousse would be a wonderful Valentine's dessert or special occasion treat! Now that Valentine's is coming up, consider making this for your honey or loved ones. Melt the white chocolate and butter in a small saucepan, stirring constantly. Set aside. Beat the egg yolks, sugar and liqueur until the mixture forms a slowly dissolving ribbon when the beaters are lifted. Pour the mixture into the top of a double boiler and cook, whisking constantly, over simmering water until very thick, about three minutes. Remove to a large mixing bowl. Whisk in the white chocolate mixture and stir until smooth and cool. Beat the cream until the peaks are stiff. In a separate bowl, with clean beaters, beat the egg whites with the cream of tartar until stiff but not dry. Gently fold the egg whites into the chocolate mixture; then fold in the whipped cream. Refrigerate until set, about 3 hours. Spoon the chilled mousse into individual ramekins or goblets. 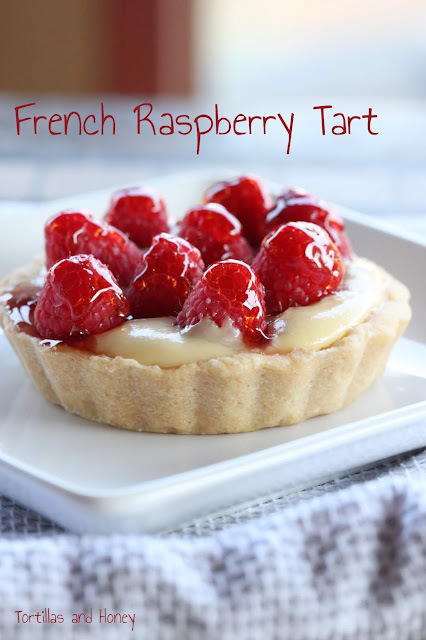 Top with fresh raspberries, and serve immediately. Keep any leftovers in the fridge. Happy New Year! I hope that you all had a wonderful holiday season and are enjoying the new year! I had two weeks off work, so I was able to do some baking, celebrate the holidays with Joe and our families, and get in some much needed relaxation from work and school. I went over a week without wearing makeup and spent several days in my pajamas, which was absolutely wonderful. I also caught up on some of my TV shows (Scandal, The Walking Dead, and The Carrie Diaries) and watched the first season of American Horror Story. I'm now back at work and in a couple of weeks I'll be back in school. At the end of the month, I'll also be having surgery to remove a kidney stone that I've had since October, which is blah but I'm hoping that 2014 will be a good year! I received three wonderful cookbooks for Christmas this year, and I am so excited to start making recipes from them. I received: Back in the Day Bakery Cookbook, Giada's Feel Good Food, and The New Southwest. I am excited to have new dessert recipes from Back in the Day Bakery (cupcakes and snowballs! ), healthy recipes from Giada, and some great innovative southwest food from Megan! Megan from the blog Scarletta Bakes published her first cookbook just a couple months ago and I've been itching to get my hands on it! Her blog is one of my favorites and I'm always looking forward to her new recipes, which not just focuses on southwest cuisine, but takes this cuisine to a while new level by creating new and innovative dishes. Being from New Mexico, I get giddy and excited about New Mexican cuisine and when someone understands New Mexico cuisine (which is different from southwest, Tex-Mex, or Mexican cuisine). Megan definitely gets New Mexican food and has some incredible recipes in her book that includes New Mexican foods. When I saw Megan's recipe for Biscochito Ice Cream Sandwiches, I knew that this would be one of the first recipes of hers that I would make. (It actually ended up being the second recipe I made because I made her red chile rubbed pork chops for our New Year's Eve dinner. Yum!) I had leftover biscochitos that I made during the holidays, so I put them in the freezer so that they would stay fresh until I made the ice cream sandwiches. I didn't make any changes to Megan's ice cream recipe, except for adding in cinnamon to it so that it has more traditional biscochito flavor when you eat it on its own. I can't see myself making biscochitos throughout the year, but I do see myself making this ice cream year-round, so I wanted more of a cinnamon flavor to mimic more of the biscochito flavor that I grew up with-- that way I can serve up a bowl of biscochito ice cream whenever I want some of that wonderful biscochito flavor! We actually had some of this ice cream for dessert last night! This is a wonderful and innovative recipe that represents exactly what I know Megan for, new twists on traditional recipes. If you like biscochitos, give this is a recipe to try. The flavors of the anise and the cinnamon go together beautifully and I love the creaminess of the ice cream. It's a great way to change up a traditional New Mexican dessert and add a little flare to make biscochitos, which are already special to New Mexicans, even more special to share with your friends and family-- which is ultimately what New Mexican food is all about! Place bisochito cookies in the freezer overnight in a freezer bag so that they are easier to work with and won't break when you put the sandwiches together. The next day, take out the ice cream and let sit at room temperature for about 5 minutes. Place the anise seeds in a dry pan over medium heat and dry toast them 3-5 minutes, until they are fragrant and slightly darkened in color. Remove from heat and place in a spice grinder, then grinder into a powder and set aside. In a large saucepan, bring heavy cream, whole milk, sugar, and salt to a boil. Lower the heat to low, and whisk in the egg mixture into the remaining hot milk mixture. Continue to cook the mixture until it is thick enough to coat the back of a metal spoon, about 5 minutes. Remove the mixture from the heat and pour through a mesh sieve into a heat and freezer safe container. Cover the container and place in the freezer until it is cool, at least an hour. Once the mixture is cooled, stir in the ground anise and cinnamon. Place the mixture into an ice cream maker and prepare according to manufacturer's instructions (usually about 30 minutes). Once the mixture is fully churned, place into a freezer safe container and store in the freezer overnight until it's fully set.